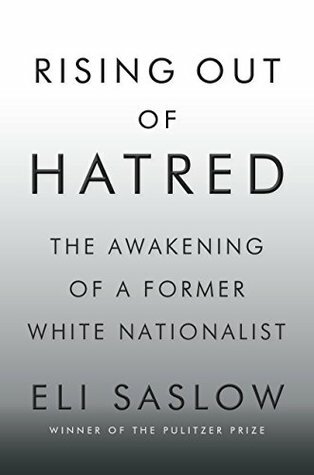 Eli Saslow is an author and a staff writer for The Washington Post, where he travels the country to write in-depth stories about the impact of major national issues on individual lives. He won the 2014 Pulitzer Prize in Explanatory Reporting for a series of stories about the rise of food stamps and hunger in the United States. He was a finalist for the Pulitzer Prize in feature writing in 2013, 2016 and 2017. I had read some of Saslow’s interviews on this before. This is more in-depth and while it made me uncomfortable I was curious. How does the heir apparent to the KKK, Derek Black, godson of David Duke and son of Don Black, suddenly change his name and his back on the entire organization? Well, it didn’t happen overnight. Derek is an intelligent man. Yes, he started a web page for White Children when he was a child, he was indoctrinated into this belief system by his father and his godfather. However he didn’t just take their word on white supremacy, he traveled, he studied and he knew more about history than most history majors. So when he made the choice to attend a liberal arts college in Florida he tried to stay under the radar. And that worked for a time. It was there that he became friends with immigrants, Jews and started questioning what he had been taught. The college could have ostracized him, kicked him out, made him quit. But the students didn’t do that. They invited him to Shabbat. They entered into a discourse that would eventually lead to Black taking back everything he had preached and going off grid. The White Nationalists were given a prize with Trump. They saw someone who said things they wanted to hear. The only thing they clashed on was Israel. Trump himself is a rabble-rouser and these guys took that as a sign to be more and more violent and confrontational. As uncomfortable as most of the book made me, I am better for having read it. I’ll have to look for this one while I’m at the library Tuesday! Fantastic review. This does sound like it’d be an uncomfortable read but an important one. And: “The White Nationalists were given a prize with Trump.” Well said and so true! It horrifies me. Might have to pick this one up, thanks for such a great review! It was hard to read but I learned a lot!